No, this is not announcing another documentary about World War II or Vietnam. This is in reference to the musical group WAR, and one of my local PBS stations ran a one-and-a-half hour concert last. They will be repeating it tomorrow (Thursday, June 4). They are in fund-raising mode and are using several music concerts during evening broadcast hours throughout the week to draw their target donors. Monday night they ran the most excellent David Foster: The Hitman concert. Catch that one , if you get a chance. The group that performed was fronted by one of the founding members of WAR, keyboardist Lonnie Jordan. Several other members of the original group perform under the name The Low Rider Band. 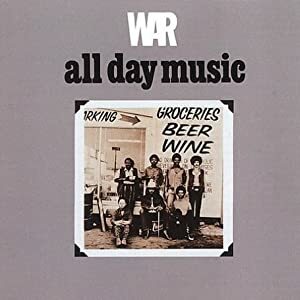 WAR is most often identified as a rock band or, more specifically, a purveyor of 70’s Funk. Those familiar with some of their major hits like The Cisco Kid, Low Rider, The World Is a Ghetto and Why Can’t We Be Friends? would probably see the validity in that. The stations in your area might not be running these programs this week, but keep your eye out for their pledge drive week. It has to be coming up soon. Hopefully, you have not already missed the Spring/Summer drive. Another program my local stations have run is Chris Botti: Live at the Boston Pops. It is a great show with terrific guest stars including Sting, Katharine McPhee. The Chris Botti show also introduced me to a new talent, Sy Smith. Doesn't she look like she can really sing? So, why am I, the jazzmonger, plugging a concert by these guys? Listen to them do All Day Music and Slippin’ Into Darkness and tell me that’s not jazz. And this question of “What can we talk about in reference to jazz?” puts in mind of an interesting discussion I have been participating in over on Kevin Kniestedt‘s “Groove Notes” blog, which you can find at: jazz24.wordpress.com. to check out the whole discussion, AND put your two cents in. One of the music blogs I follow is Geezer Music Club (go to http://geezermusicclub.wordpress.com) which is hosted by Big Geez. It is an impressive compendium of reviews, photos, film clips and history on great performers. He has a lot of the old, as well as good info on the new and contemporary. a 1952 recording session — one of historical significance. “Ain’t It a Shame,” he appeared to be on his way to a long career. You get the idea. This is just the start of a very informative article that includes a sound clip of “I’m Gonna Get Married,” and a video of Lloyd performing “Personality” live. Geezer Music Club is, obviously, the product of a deep appreciation for music history coupled with a lot of very fine work. Do yourself a favor and check it out. Just don’t replace me on your list of favorites, okay? PBS’ American Masters series has recently been showing a terrific retrospective on the life and career of the incomparable Les Paul. If you have not seen this program, look for it in your schedule and make time to watch, TIVO it, whatever you have to do. Les is the true “Godfather” of Rock ‘n Roll and, in fact, all of the modern recording industry. He is the inventor of the solid-body electric guitar, over-dubbing, multi-tracking and hundreds of other innovations in sound recording. He holds nearly fifty patents, last I heard, and the modern recording studio, with its multi-tracking sound board would not exist without his creativity and curiosity about music and sound. On the program, you will see the original eight-track recording unit that Les built in his garage workshop and learn how he came up with many crucial inventions. But, most of all, you will hear some terrific music. There is film from the great days of Les Paul & Mary Ford, when they were dominating the pop charts. You will see him in duets with a host of contemporary musical icons, all of them worshiping this unique genius. Amazingly, now in his 90’s, Les is still playing Monday night gigs at The Iridium in New York City and jamming at each performance with the likes of Keith Richards, Eric Clapton, & Mark Knopfler who come up out of the audience to play with the best of them all, Les Paul.